Hand wash is one of those things that we all use many times a day, and some hand washes can leave the hands feeling super dry and uncomfortable especially if they contain an high percentage of alcohol. I’ve always used the Palmolive hand washes, but after trying a Molton Brown hand wash, I’ve fully converted to using luxury hand washes so the MOR Bohemienne Hand and Body Wash and matching lotion were a very welcome duo. MOR are an Australian, based luxury bath, body and home fragrance brand and I’ve featured a couple of their products on my blog thus far. MOR’s philosophy is to provide an unique sensory journey with finely blended formulations and exceptionally detailed and opulent packaging. Each of the MOR fragrance collections is inspired by the tales of ancient civilisations and it’s just a super luxurious brand which really cares about the attention to detail. 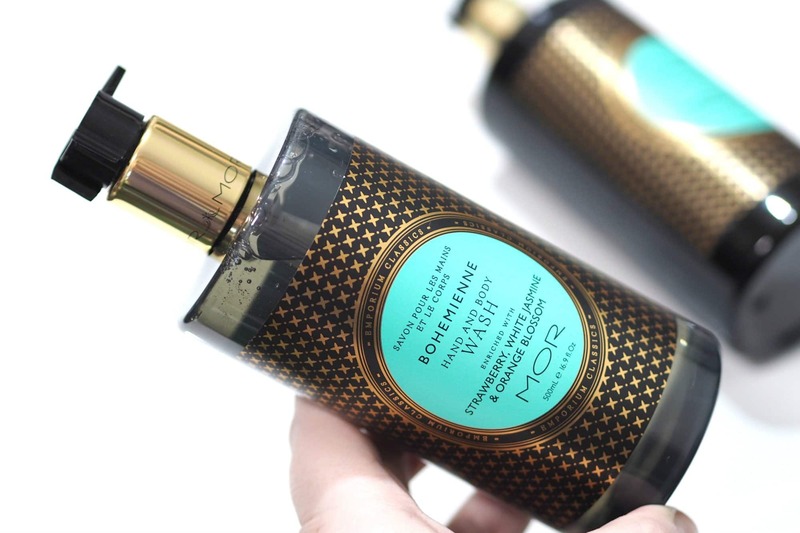 MOR have a number of fragrances for their bath and body products, but I have the MOR Bohemienne Hand and Body Lotion £19 and the MOR Bohemienne Hand and Body Wash £17. 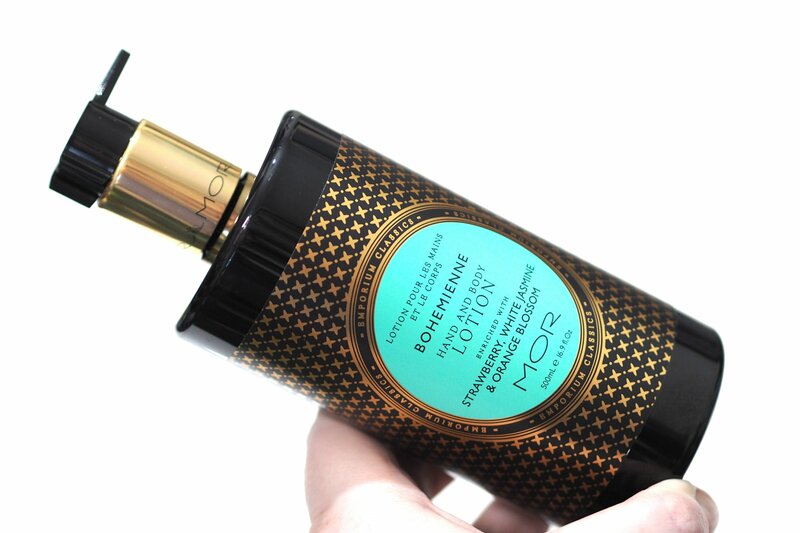 The MOR packaging is so luxurious and chic across all of their product ranges, but this wash and lotion have an amazing black and gold design with a brightly coloured circle on the front. Both bottles have luxury gold metal pumps, and they look amazing on the side of my sink. The MOR Bohemienne duo are said to be bountiful with extracts of Strawberry and Chamomile and blended with White Jasmine, Orange Blossom and Jojoba oils, and they’re part of the Emporium collection. The Bohemienne scent has top notes of Strawberry, Mandarin, Cassis and Orange Blossom, an heart of White Jasmine, Sugar and Apple and a base of musk, peach and raspberry. I can’t even describe how amazing the scent is of this duo. The hand and body wash lathers nicely to thoroughly cleanse the skin without stripping the skin of moisture and I’m loving using it as an hand cream alongside the matching lotion. They have a delicious sweet orange scent which linger on my hands for hours, and I’ve never found a better smelling hand wash than the MOR Bohemienne wash. 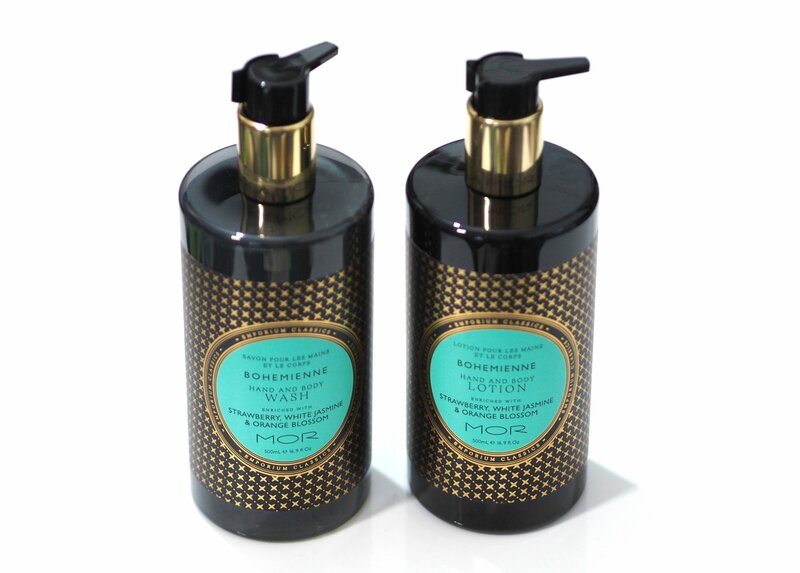 I know £17 seems pricey for an hand wash or £19 for a lotion, but it’s for the body and hands, and it contains an huge 500ml so it really is great value especially compared to Molton Brown hand washes – and in my opinion the MOR Bohemienne wash is better quality than the Molton Brown hand wash. I know Christmas is over but these are such giftable products as they are so fancy and I feel like they look like they should cost a lot more than they do. I’d love to know if you’ve tried anything from MOR before?